Buy Just Natural Organic Whole Black Peppercorns - 25g in the UK from our online shop or directly from our independent Scottish store. Use black peppercorns in all sorts of dishes to spice it up. Ideal for using in a peppercorn grinder or with a pestle and mortar. Adds heat to all your dishes, including strawberries! A delicious, spicy pickle of carrot and radishes, which are in season now and the coming months. This recipe contains 1 tbsp black peppercorns. We sell real Just Natural and other Herbs & Spices directly from our shop in Scotland and online throughout the UK. Where can you buy real Black Peppercorns - Organic safely online? If you are wondering where you can buy Just Natural Organic Whole Black Peppercorns - 25g safely online in the UK, then shop with us. We are an actual health foods shop; with real people selling real foods and products. Our award-winning independent shop is located in Stirling, Scotland since 1976. You can buy our Herbs & Spices in store or safely place an order with us online or over the phone. 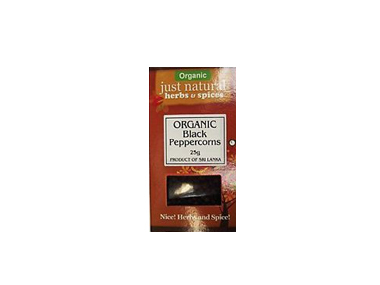 Black Peppercorns - Organic - Just Natural Organic Whole Black Peppercorns - 25g in Herbs & Spices and Herbs, Spices & Salt.